The following article appeared in The Bennington Evening Banner, (Bennington, Vermont) on July 28, 1909. The name of the balloon mentioned is the “Pittsfield”, named for Pittsfield, Massachusetts. “Conway, Mass. July 28 – Parachuting his balloon, Pittsfield, at a height of over two miles by loosening the appendix cord and allowing the lower part of the balloon to rise into the netting, Dr. S. S. Stowell of Pittsfield, in his first trip as pilot yesterday made a drop to earth. The experiment was probably the first of its nature ever tried in this country. The balloon ascended from Pittsfield at 10:25 o’clock. The passengers were John T. Manning of that city, and Mrs. Blanche Hutz, a nurse in Bellevue Hospital, New York. Over Ashland and Buckland the aeronauts struck a vortex, which once before has troubled balloonists, and were swept rapidly upward to over two miles. 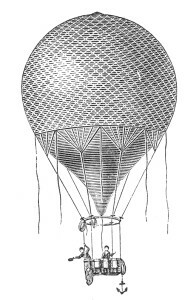 At this height, with but one bag of ballast left, Dr. Stowell conceived the idea of parachuting his balloon and allowing it to take its own course to earth rather then use the valve cord and allow gas to escape. The appendix cord was loosened and the Pittsfield, resolving itself into a monster toadstool, started slowly earthward.